The blog is not loaded from the home page. The home page serves as a landing and indexing page. The home page provides access to contents of recipes, ingredients, and pantry. 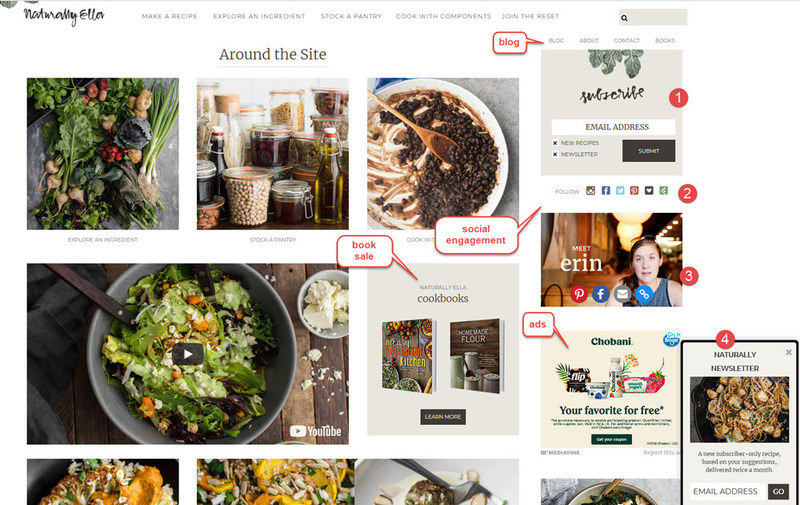 It also promotes the blog owner's cookbooks. The graphic ads banners are blended with site photos. A button on top leads to the blog site in a sub-directory. The blog comes with big photos and big text fonts on the white background. Advertising banners are lined on the right side bar. The small pop-up window pops out at the lower corner for newsletter sign-up. These professionally-shot big photos are astonishing. This blog was started with LiveJournal years ago. Now it is running on WordPress. The Simple Recipe Pro plugin makes the customization of the blog. The USP represents a decade’s worth of learning how to cook seasonal plant-based meals. Naturally Ella is not a general receipt blog. Instead, it focuses on seasonal, naturally healthy, vegetarian recipes. For example, the burger recipes include Curry Chickpea Burgers with Coconut Cabbage Slaw, Wild Rice Veggie Sliders with Herbed Ricotta, Homemade Veggie Burger with Brown Rice, Oat, and Nuts, etc. which you cannot find in fast-food restaurants, but made home by following the receipts here. The receipts are well organized by make-sense categories. The blog also plays up the region’s farm-to-fork abundance. Affiliate income is the may cash flow. This blog embeds affiliate links to relevant products such as capers, veggie broth and coconut milk. Naturally Ella entered several brand partnerships (Bob’s Red Mill, for one) to enhance the brand and attract more visitors. The page views reached 500,000 monthly to make the primary income by pay-per-click ads. The success and popularity of the blog help promote two cookbooks written by the blog owner. The Homemade Flour Cookbook (224-page) and The Easy Vegetarian Kitchen (195-page) were self-published by Fair Winds Press and are sold at Amazon and other book selling networks. Naturally Ella is active on Instagram (88k followers), Facebook (43k likes), and Pinterest (49k followers). It is inactive on Twitter. There are also many YouTube video promotions.